Listen with empathy. In other words, attempting to see your horse’s real reasons for reacting: survival. We will talk about listening with empathy in this section. Validation to build trust. Validation is about honoring the horse’s fear and showing him you understand his experience by taking action, simplifying the behavior. This includes increasing the horse’s tolerance for pressure over time. By doing so, you can avoid full-scale reactions (if any at all). These are covered in depth in Rules #3 & #4 in my 5 Golden Rules Course. Thus, a requirement for empathy is this: Know that everyone is simply trying to survive. You don’t have to like everyone or agree with them, but know you share the same struggles. Every second of the day, we are trying to survive both physically and psychologically. Every thought, choice, and movement is meant to preserve our existence. Every inconsiderate, violent and seemingly hateful action are strategies to minimize pain and chances of death while holding onto life. When someone reacts, they are revealing to you their deepest fears and vulnerabilities. Recognize this as a call for love; the wild horse inside them crying out in fear. With this understanding, we can respond with compassion rather than another reaction that feeds their own. With love, we can stop the cycle. In other words, this understanding leads to compassion and the compassion is what allows me to respond in a way that allows me to help guide them through that fear rather than react back and feed the cycle. So if we don’t react back to the horse’s reaction, how do we take action and respond to the horse’s reaction to ultimately teach him to respond as well? 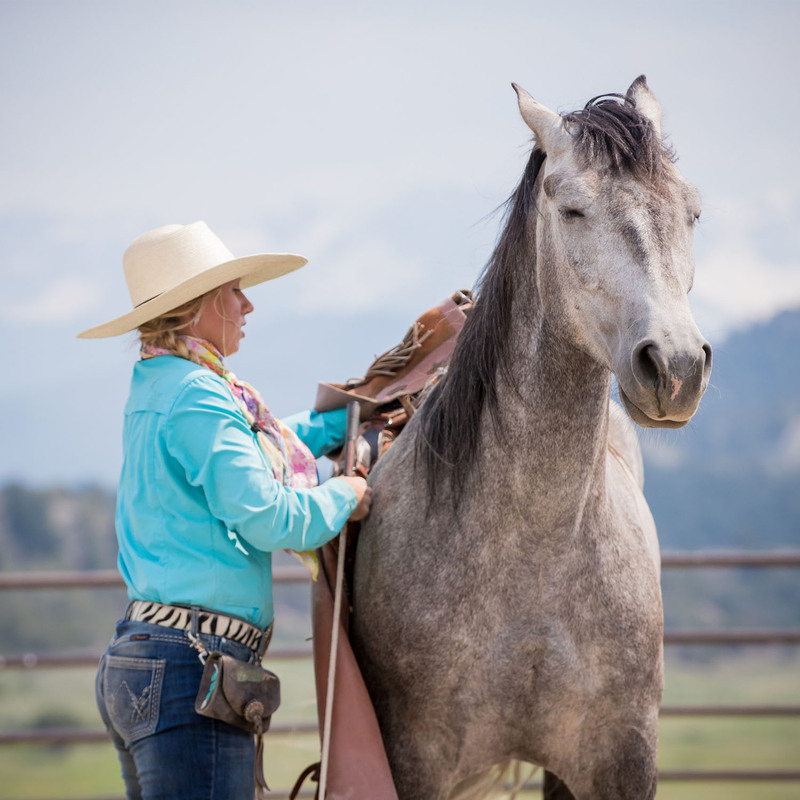 From a scientific perspective, teaching the horse to respond in a calm and relaxed manner to pressure involves literally rewriting the script in the mammalian brain and creating new connections and neural pathways. That means we have a large task at hand—we must reboot how the horse navigates through his environment. Our job is to teach the horse to respond to pressure, which we can accomplish through the use of negative reinforcement, or using a humane onset of pressure to motivate him to find the release. How does this work? In traditional practices, when a pressure is introduced (mental or physical), we must continue with the pressure until the animal offers the smallest sign of responding versus reacting. At that moment, we must release to reward the animal for thinking through the situation. Consider a horse who reacts to touch on his legs by kicking out, which is a natural survival instinct. If the human releases the touch on his legs at the moment of the reaction, the instinct is reinforced. But by continuing with the mental pressure of touching his legs until he stopped kicking for just a moment, the human is able to offer guidance through the situation and reinforce the behavior of responding to that pressure. Over time, he will be able to approach a wider range of new situations by responding instead of a reacting to the trigger. Take a moment to consider a child who has a case of “monsters-under-the-bed-syndrome.” What is the typical response when a child is frightened by the ‘monsters?’ Oftentimes, the adult’s response is something like, “Don’t cry! Monsters don’t exist, there is no such thing!” And so, the child’s fears continue, night after night. This is an example of invalidating the child’s feelings—we communicate that the child is not right for feeling what he is feeling. The anecdote to the child’s fear is the opposite—Validation. Validation means taking time to express that you understand another’s experience in that moment; that you understand why they are feeling what they are feeling, not as if their experience is bad, wrong, or crazy. Many times all the child wants is to be heard and understood; to have their fear honored rather than rejected. They don’t have the words to be able to articulate that the fear of abandonment (a dependent child’s greatest survival threat) arises at nighttime; instead, the monster serves as his voice. It’s just what makes sense to them. Validation can immediately soothe negative arousal. When people (or horses) are on the defensive they are in a negative arousal state; they are physically preparing to go into fight or flight. When in this state, knee jerk reactions are almost uncontrollable. However, validation strategies soothe fight, fight, or freeze reactions. When the horse or human feels understood, there is no need to go into battle. The alternative then, it validate how the horse is feeling and acknowledging the monsters! How do we provide validation to our horses? You don’t have to agree with their reaction—You know a plastic bag isn’t going to kill them. But you do have to let them know that you understand their experience in that moment. Instead of telling the horse they are wrong for experiencing what they are experiencing, you open yourself up to understanding it. This is what opens communication up. Validation lets two individuals truly communicate about the root of problem rather than resort to attacks or defensiveness. In Rule #2 of my 5 Golden Rules course, I cover in depth how to allow the horse the freedom of choice, thereby validating the emotions that come up during a behavior. The horse will have the freedom to actively participate or to communicate when he feels ready to start a behavior or feels it needs to end. This is accomplished through two way communication, the redirection technique (when using positive reinforcement, reward based training), and the win-win situation (when using negative reinforcement, pressure and release). In Rule #3 of the course, you will learn to read a horse’s precursors for reacting and stay out of the reactivity zone and in Rule #4 of the course, you will learn how to gradually increase the horse’s tolerance for pressure. Using these tools, you will be teaching the horse to respond versus react to pressure without necessarily having to put the horse through a reaction. In other words, you teach the horse to accept touch on the leg without kicking out without him necessarily having to kick out to learn not to show that behavior. The process—when done well—is incredibly smooth. When a horse has truly mastered responding and thinking through all types of pressure, even in high-pressure or seemingly dangerous situations, he will approach every situation like he is solving a puzzle; this behavior will be defined by curiosity, engagement, relaxation, confidence, and willingness to think through the pressure logically. In turn, such behavior will keep him safe in a modernized world, which poses new risks that require a new form of thinking. PreviousPrevious post:Lesson 5: Saving Willie & Saving the WorldNextNext post:Part 1: Why Dolphins?